The start of this suggested walk is Pfingstegg. Take the cable car from the lower cable car station (Pfingsteggbahn) which is situated about a kilometre from the main train and post bus stations in Grindelwald at the east end of town. Alight from the top station of the Pfingstegg cable car, turn right and take the signed path to Stieregg. Follow the path to a gate and pass through it to the adjacent meadow, hoping that the rather large resident pig has not decided to fall asleep across the gate blocking your way as it did for me on my return! For the first few hundred metres the path meanders through an attractive grassy area but then becomes more dramatic as it approaches and follows the cliff edge above the Lower Grindelwald glacier gorge with spectacular views down to the river far below. A protective fence alongside the path in the most exposed areas does offer some comfort to those who dislike heights however it would be sensible to take extra care in parts where the fence line finishes. I was fortunate in having another fine and sunny September day for my walk sharing the path with only a handful of walkers. Other than the exposed sections already mentioned the path is straightforward and after a steady climb the Berghaus Bäregg finally comes into view. Along this section of the path the distinctive rumble of minor ice and snow avalanches that tumble down into the gorge can often be heard well before they are observed. The Berghaus Bäregg is situated in a near perfect location with a balcony that overlooks the Lower Grindelwald glacier and has an incomparable vista of surrounding peaks. Sitting there in the midday sunshine and having a very enjoyable lunch with a glass of beer and wine enjoying the peaceful surroundings reminded me once again of the intense and lasting pleasure that venturing into the mountains provides. As more walkers started to arrive and my reverie broken, I reluctantly left and made my way back along the path to Pfingstegg encountering numerous walkers making their way up to the Berghaus and congratulating myself on deciding to have an early start. On reaching the Pfingstegg cable car station I decided that as it was still early afternoon, rather than catch the cable car back to Grindelwald, I would walk down. I therefore followed the well signposted path down to the Hotel Wetterhorn and then caught the, rather busy, local post bus back to Grindelwald. 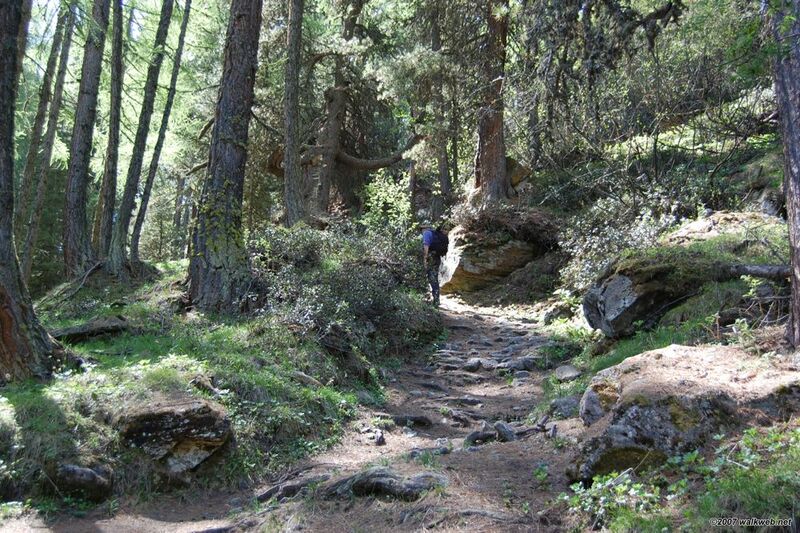 This walk, although short, is highly recommended as an opportunity to experience the ambiance of the higher mountains particularly for those who have not ventured above the snow line. 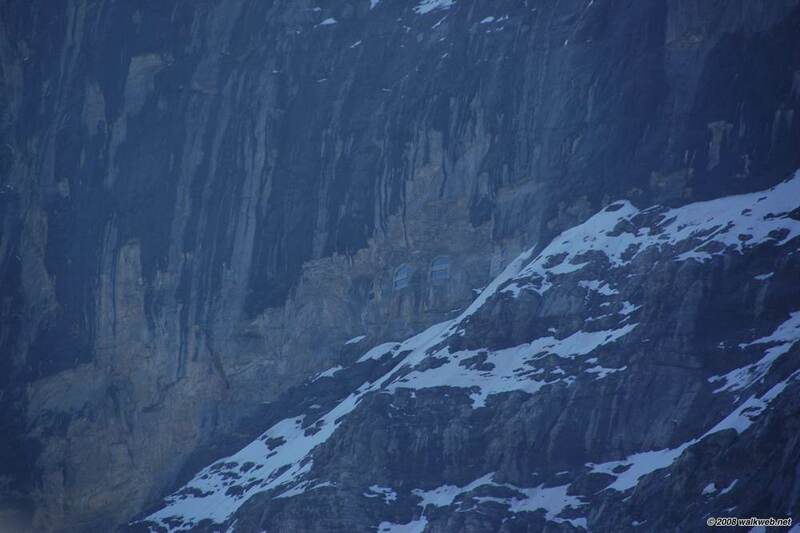 I consider that Berghaus Bäregg would be an ideal place to stay overnight to reinforce such an experience. Duration: Pfingstegg – Berghaus Bäregg 1775 m. Approximately 2 – 3hrs return (Route 24 on Jungfraubahnen Hiking Map) & Pfingstegg – Halsegg – Hotel Wetterhorn 1hr (Route 23 on Jungfraubahnen Hiking Map) not including breaks. This walk starts at Grindelwald railway station from where you follow the lane leading down past the Grand Regina Hotel then the well-marked path to Grindelwald -Grund railway station. Trains to Kleine Scheidegg and the Jungfraujoch leave from here. After crossing the road bridge follow the signs up the lane leading towards Brandegg – Alpiglen and Kleine Scheidegg (Route 34 on Jungfraubahnen Hiking Map). The path continues steadily upwards initially making its way through pastures dotted with numerous holiday homes and farmlets and eventually passing through forest then climbing up close to the train lines before reaching the Berghaus Alpiglen 1615 m, 2 – 2 1/2 hours after leaving Grindelwald. Benefiting from another glorious September day the scenery throughout the walk was magnificent with views down to Grindelwald and across the valley to the Faulhorn mentioned elsewhere. From Alpiglen the proximity of the Eiger North Wall and the imposing three peaks of the Eiger, Mönch and Jungfrau dominate the route. Underfoot the route is easy going, despite being uphill all the way, along graded paths and roadways requiring little if any route finding ability. After leaving Alpiglen the path crosses the rail line climbing gently upwards until Kleine Scheidegg 2061 m, eventually comes into view. At this stage of the walk the relative peace and tranquility enjoyed earlier in the day sadly comes to an end by the presence of the sheer numbers of tourists who visit this magnificent natural lookout, mostly by train. On the other hand it does mean that a cold beer and something to eat after an ascent of approximately 1000m on a warm day is readily to hand. From Kleine Scheidegg walkers can choose either to continue on to Wengen and Lauterbrunnen and thus complete the seventh leg of the Alpine Pass Route or return to Grindelwald on foot or by train. 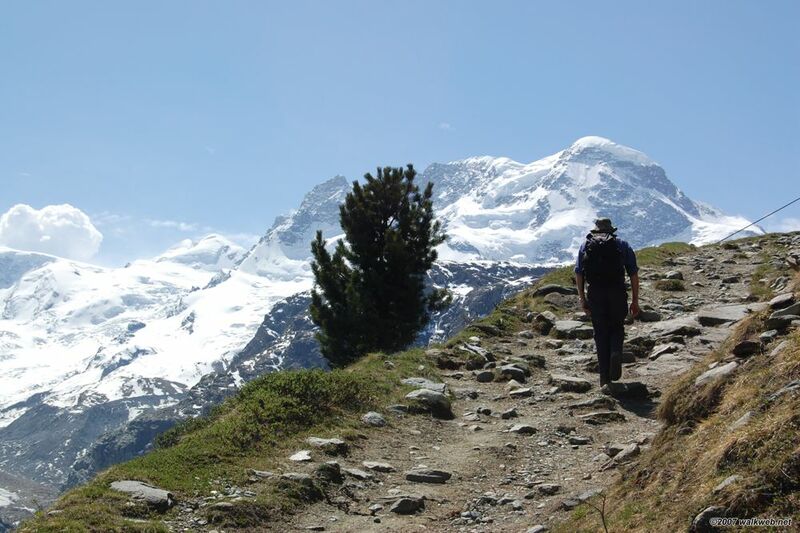 A classic if not particularly demanding walk and one of the most scenic in the Bernese Oberland. Well worth the effort despite the hordes of tourists and ideal for stretching ones legs before moving on to more challenging routes. The start of this suggested walk is Schynige Platte. Staying in Grindelwald meant catching the train down to Wilderswil, on the Grindelwald – Interlaken rail line and then transferring to the historic narrow-gauge cog railway that winds its way upwards to Schynige Platte (1987m). A walkers combined ticket can be arranged at the Station in Grindelwald to include the rail journey, cog- rail, and the First-Bahn back to Grindelwald. As the period of operation of the cog-rail and First-Bahn varies depending on the time of year it is highly recommended that you check the time of the last gondola from First and allow sufficient time for your hike or you may be faced with an unwelcome long walk back to Grindelwald after a rather tiring day. The cog railway takes around 45 minutes to haul its way up to Schynige Platte station from where one can get the first glimpse of the superb views of the Jungfrau region. Not far from the station I located the signpost for ‘Panoramaweg’ (Route 61 on Jungfraubahnen Hiking Map) and decided to follow this route, which is a variant to and slightly longer than the normal path (Route 62). 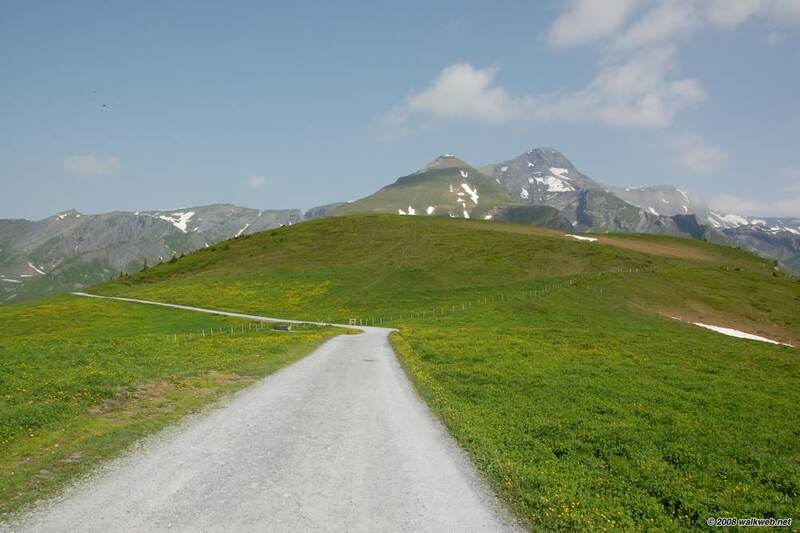 The path is well marked with the traditional white/red/white striped markers and signposted at various intervals: Oberberghorn – Laucheren – Faulhorn – First. Narrow in places the path follows the ridgeline via the rocky peaks of the Oberberghorn and Laucherhorn giving fantastic views down to Interlaken and Brienzersee. The ‘Panoramaweg’ doubles back by a lower route to Schynige Platte at Laucheren (Map shows Lauchern) whilst the path to the Faulhorn (Route 62) meanders along the side of scree slopes, over grassy terrain and through gaps in the rocky spurs before reaching Egg. From Egg the path eventually opens up and passes into a small enclosed valley with interesting stratified rocky terrain above a small lake ‘Sägistalsee’ before it ascends the southern slopes of the Sägistal before veering south west and eventually climbing up through an interesting rock gully to reach ‘Berghaus Männdlenen Weberhütte at 2344m, offering a welcome break for a leisurely lunch if time permits. Bearing left after leaving the ‘Berghaus’ the path continues upwards to gain the ridge of the Winteregg and eventually to the final exhilarating steep section leading to the summit of the Faulhorn at 2681m where you are rewarded with spectacular views in all directions and the opportunity to sit and enjoy the vista with refreshment readily available from the ‘Berghotel Faulhorn’. Leaving the summit down towards the small col at Gassenboden the path to First leads downhill, in an easterly direction, to the tranquil lake of ‘Bachsee’. The path follows the left hand side of the lake and then drops steadily towards First 2168m where hopefully the First Bahn is still operating giving you a relaxing ride down to Grindelwald and a well deserved beer. The walk was undertaken In late September 2009 in slightly misty conditions at the start but gradually improving to a warm and sunny day. Route finding under the prevailing conditions was not a problem at any stage. Leaving the station at Schynige Platte around 10.15 am I arrived at the Faulhorn summit around 13.45 and First by about 15.30 with minimal breaks. On the first stage of the route from Schynige Platte to the Faulhorn summit I met very few other walkers, no more than a dozen coming from the direction of the Faulhorn. From the Faulhorn onwards the numbers increased substantially with the most popular section, not surprisingly, being the well-worn path between First and Bachsee. All in all a highly recommended exhilarating if somewhat tiring classic Alpine walk combining varied scenery and stunning views. 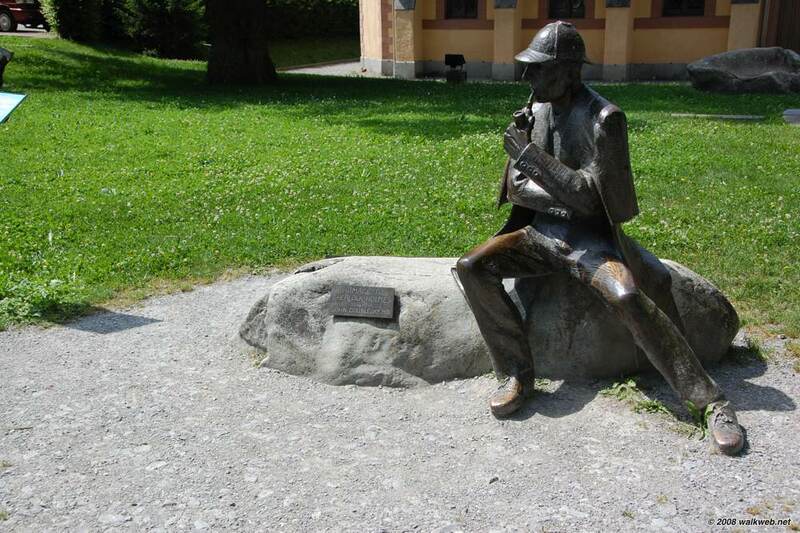 This last suggested walk is a short trip up to and around Reichenbach Falls near Meiringen, probably most famous as the setting for what was supposed to be the final Sherlock Holmes story “The Final Problem”. 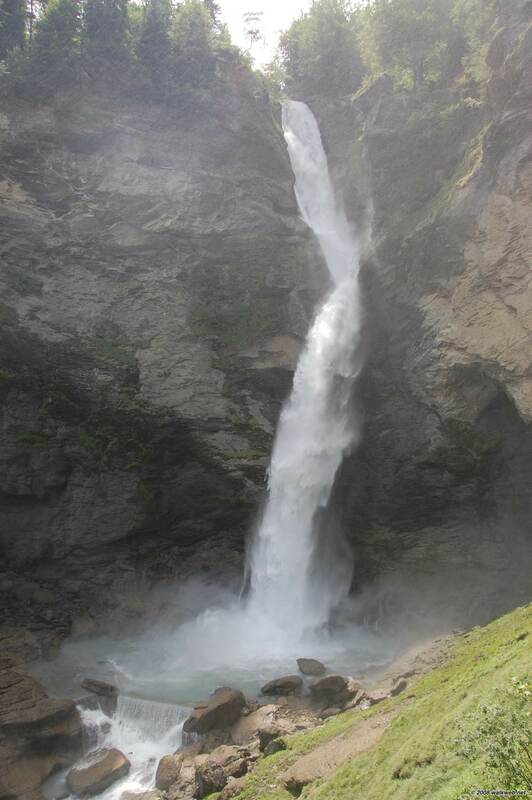 Access to Meiringen from Grindelwald is via bus and post-bus (via Grosse Scheidegg) or via train from Interlaken Ost. 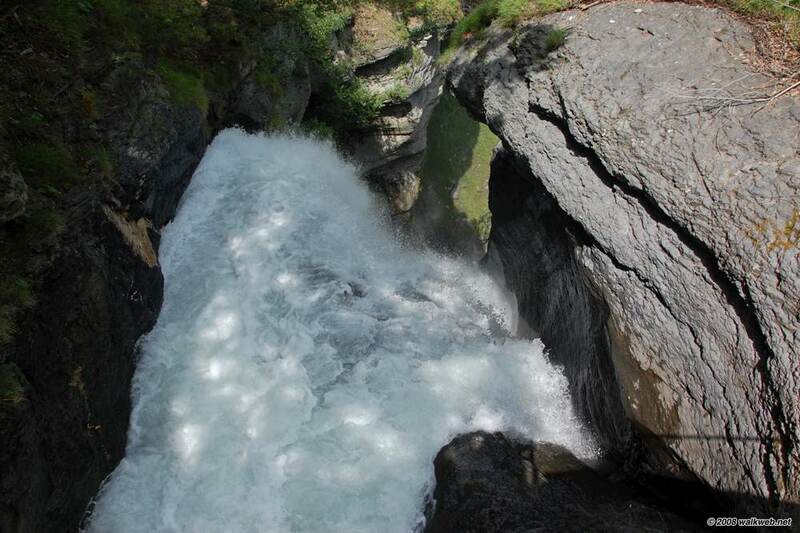 The walk commences at the Reichbachfall-Bahn funicular station at the base of the falls (operates between mid-May and mid-October, 08:15 to 11.45 and 13:15 to 17:45). 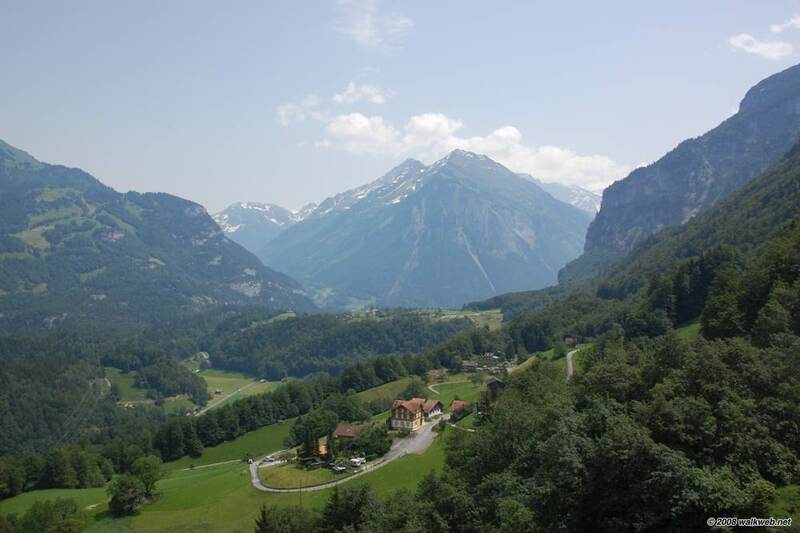 The station is just outside Meiringen (about 20 mins or so walk from the town centre). After riding on the funicular and arriving at the top station walk out to the viewing area for a good first close-up view of the impressive falls. From here a clear path leads up to the right and climbs by the side of the falls, eventually crossing over the river. Most people turn back here and return to the funicular, but the suggestion is to continue along the path as it drops to the other side of the falls. The path goes through woodland before a junction is reached with Reichenbach falls sign-posted down a track to the left. Follow this path as it descends, ignoring for the moment a side track signed Meiringen that drops off to the right, until it reaches an excellent vantage point overlooking the falls and marked with a white star and plaque as the point where Sherlock Holmes and Professor Moriarty were locked in their apparently fatal duel (of course it turned out that Holmes survived). 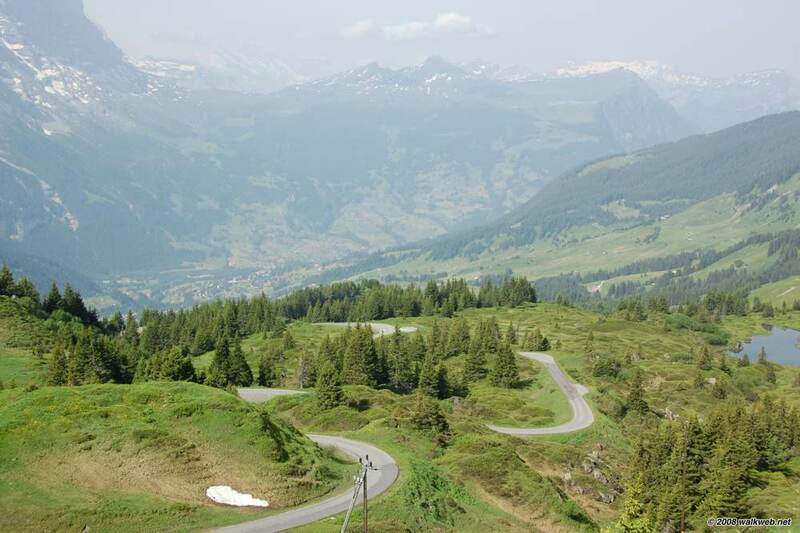 After admiring the view go back to the track junction just passed and follow it as it descends back into Meiringen. There is another excellent view of the falls a little further down. The footpath then eventually reaches the main road into Meiringen, the turn-off back to the falls is on the left; alternatively, continue walking and then turn right over a bridge and back to Meiringen town centre. If you are staying at Grindelwald, a suggestion is to take the train from Meiringen to Brienz and then paddle-steamer across Brienzersee to Interlaken Ost from where the train to Grindelwald can be accessed – the bus station office at Grindelwald can sell a ticket that covers the whole circuit (i.e. also including the bus trip from Grindelwald to Meiringen). 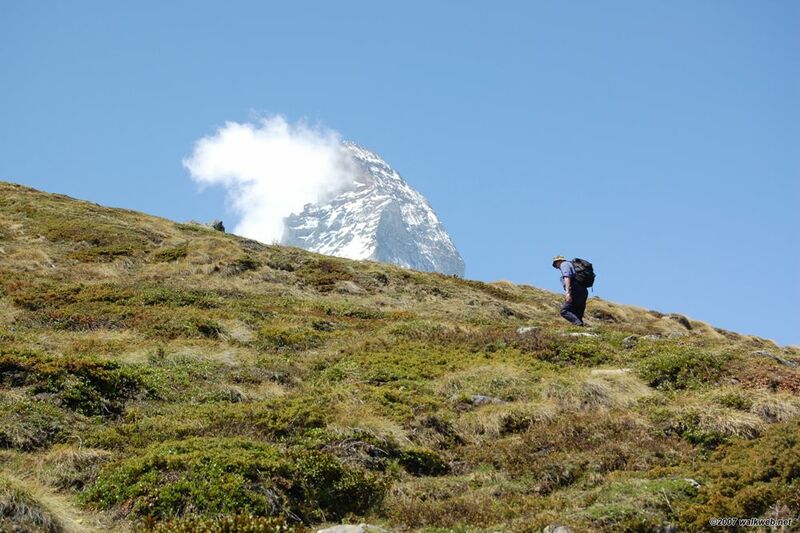 This suggested walk is an easy mountain walk (in good weather) from Grosse Scheidegg to First along a well used footpath and represents an excellent introduction to mountain walking and the Grindelwald area. There is a cafe at the end of the walk and an enjoyable cable car ride back down to Grindelwald; alternatively the walk could easily be extended. Access to Grosse Scheidegg is via bus from Grindelwald. Buses leave from the main car park just up from the station. From Grosse Scheidegg the start of the walk is clearly sign-posted to the left of the bus stop. The walk initially follows a clear vehicular path (walk no. 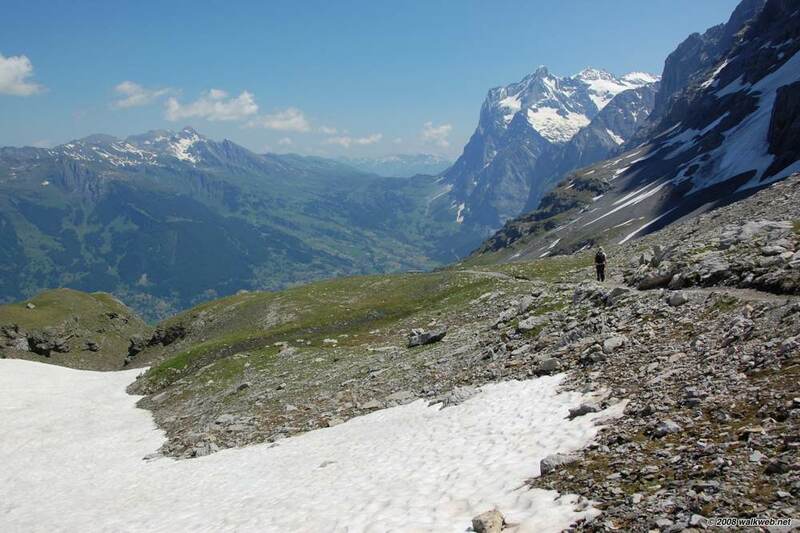 6 on the Jungfrau region hiking map – see below), just below the ridge with excellent views in all directions. Looking westerly gives a different profile of the Eiger, and Grindelwald can be seen in the valley. Looking directly ahead along the path is Gemsberg and Schwarzhorn. The vehicular path soon starts to drop down to the left but while this route could be taken, the suggested path continues ahead along what is now a foot path as it keeps to the higher ground, also curving to the left and then continuing along an obvious path to First, with a rather steep but short section right at the end for the final pull up to First. First has, in addition to the cable car terminus, a gift shop and cafe with a terrace that also commands outstanding views. From here you may see paragliders launching from a point close by. Access back to Grindelwald is via the cable car, or alternatively by walking down along the clear trail (walk nos. 8, 12 and 15). Total walk time for me was around 1’15”. 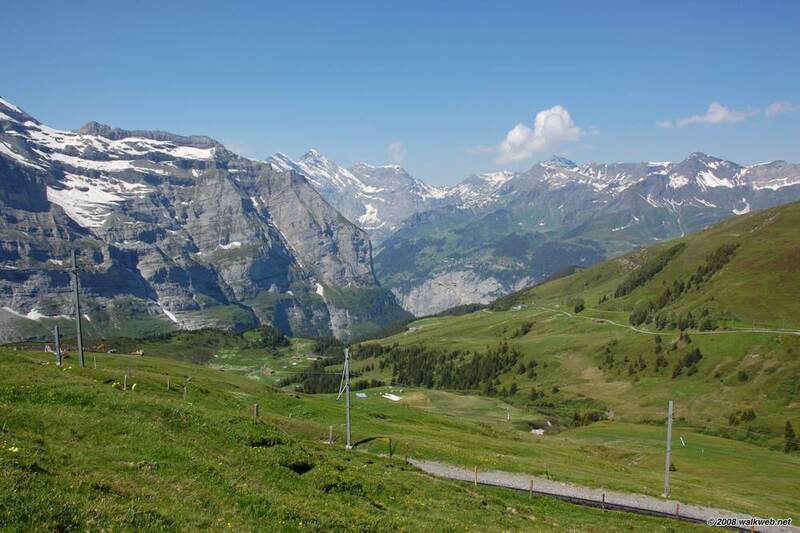 This suggested walk commences at Kleine Scheidegg. From Grindelwald there is direct access via train – trains also travel to Kleine Scheidegg from the West (Wengen and Lauterbrunnen). From Kleine Scheidegg the walk starts near the train line up to Jungfraujoch – this is walk no. 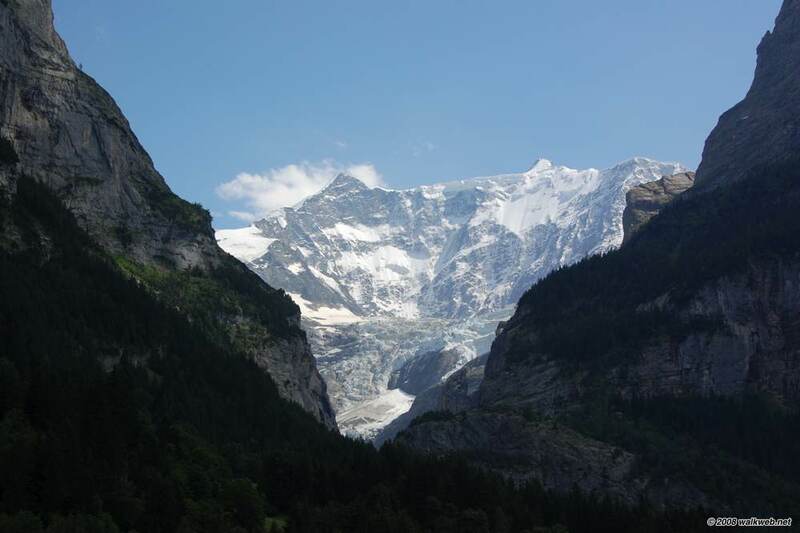 37 on the Jungfrau region hiking map (see link below). The walk climbs steadily uphill along an obvious path, at all times keeping fairly close to the train tracks and eventually reaching Eigergletscher station, the first station on the Kleine Scheidegg/Jungfraujoch line. At the station, follow the platform downhill briefly before crossing both lines and following a path clearly signposted as ‘Eiger – Trail Alpiglen 2 h’. This is walk no. 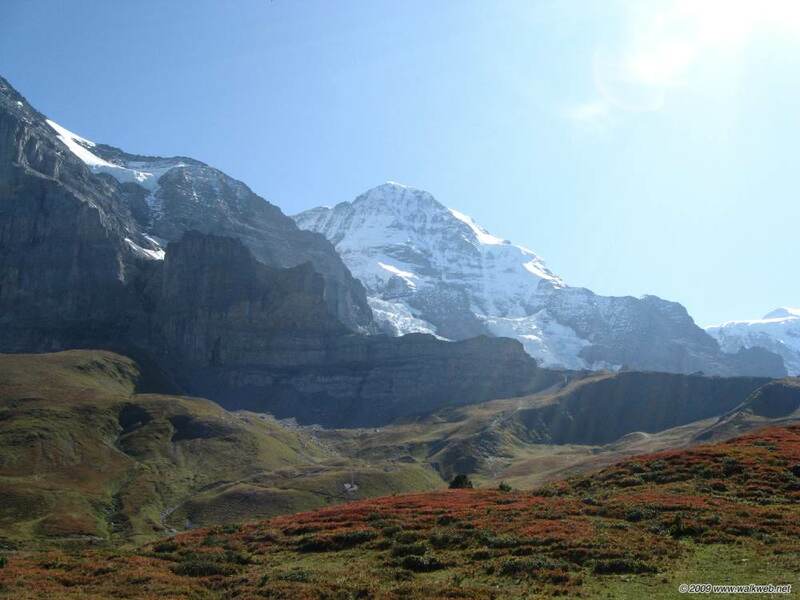 36 on the Jungfrau region hiking map and is the official ‘Eiger Trail’ along the foot of the impressive and imposing Eiger North face. The track is again quite clear, with only the occasional patch of snow obscuring the path (these notes were written in June). In addition to the view of the Eiger, there are superb views in all other directions, and plenty of great locations for a break or lunch. After negotiating the section at the foot of the north face the track starts to curve rather more steeply downhill and after a zig-zag section comes to a t-junction. Turning left, the track will soon arrive at Alpiglen Station. The suggested walk though follows the right turn (walk no. 25) and eventually arrives at Grindelwald. The track goes through an attractive wooded section, with some repeated up and down sections before reaching a small hut and then turning more steeply downhill to reach Gletscherschlucht and a good place to stop for a beer. From here there are clearly signposted paths back to Grund or Grindelwald. Total walk time for me was around 6 hours (including breaks). Note that the last section of the walk from the t-junction through to Gletscherschlucht and then Grindelwald, is longer and more difficult than it looks on the map. 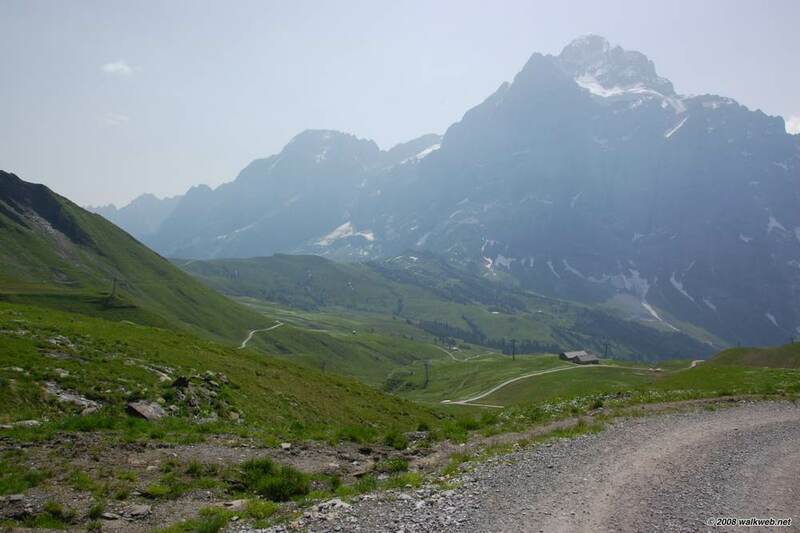 If tired, take the shorter route to Alpiglen and then train back to Grindelwald. 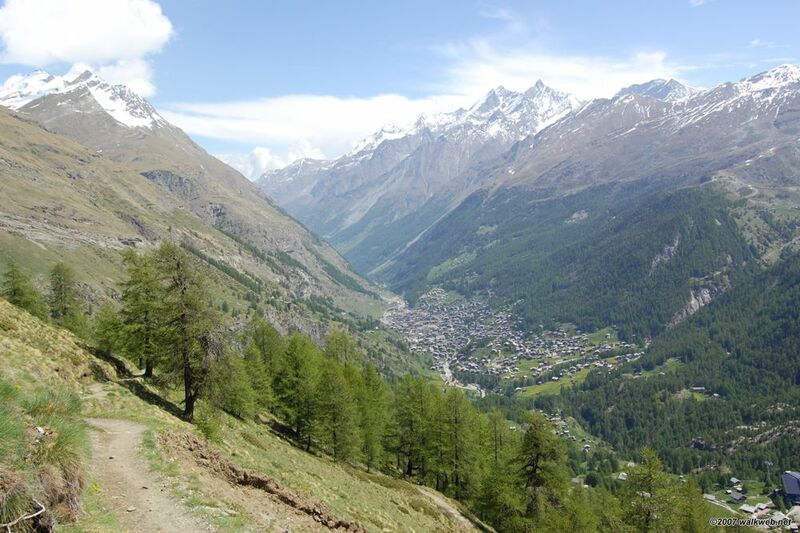 For this final walk we had travelled to Zermatt at the base of the Matterhorn and now a major ski resort. We were there in May, probably not the best time – quite a few places were closed as May is taken as a holiday month by some of the hotel/restaurant owners between the Winter and Summer seasons, and the whole place seemed to be a building site. It is billed as a “car free paradise” and indeed cars are not permitted, the locals getting around in electric golf-buggy like vehicles, but there were a huge number of diesel trucks and a helicopter feeding the building industry. Thankfully, this was all easy to escape by getting out of Zermatt proper. We started the walk from Furi, having taken the cable car there from Zermatt (we had originally planned to walk from Trockener Steg, but there was still too much snow on the trails at this height – indeed there were still a few downhill skiers in the area). 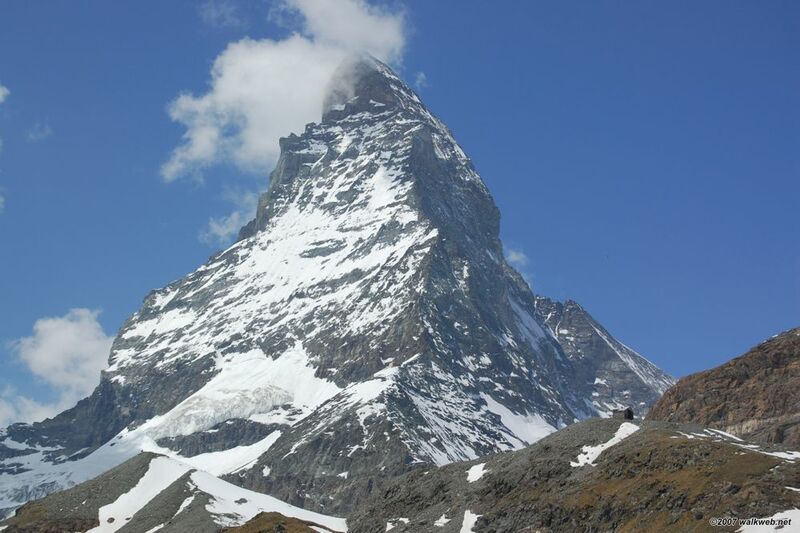 The walk (route 28 in the “Adventure in the Mountains” hiking guide) climbs the spur that ultimately leads to the base of the most popular route up the Matterhorn. Initially in a forested area, the trees soon disappear, providing stunning views in all directions including a particularly fine view of the Matterhorn. 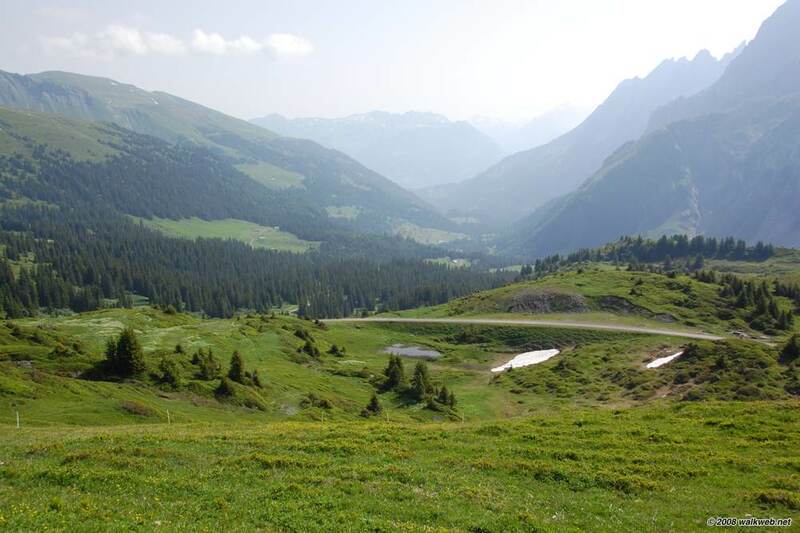 This section finishes at Schwarzsee Paradise – walk time is 1.5-2.0 hours with a 730m gain in elevation. At this point you could get a cable car back down to Furi/Zermatt (we were again too early in the year and the system was not yet operating) but we chose to walk down via Stafelap (route 29 in the “Adventure in the Mountains” hiking guide). This proceeds north-westish, before curling around to the east and proceeding along a well formed track back into Furi. This section is about 7.5km / 2 hours or so. Again, another A+ walk, and highly recommended. We got around on Switzerland’s excellent train system. If you’re visiting it’s worth checking out the various passes that the railways offer before you arrive as some can only be purchased outside the country. I purchased a half-price travelcard (around 100 Australian dollars) which gave 50% off every trip I made (including the regional railways and cable cars). See Swiss Railways information for international visitors.